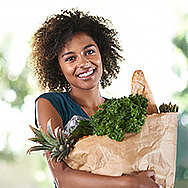 Does a Vegan Diet Benefit Skin? Research is clear that a diet for good skin means eating a variety of nutrient-rich foods, especially deeply coloured vegetables and berries, non-saturated fats, yogurt, lean protein, whole grains, and nuts. But, only in balance, too much or too little is never a good idea. (Don’t you just hate hearing again about the benefit of a balanced diet—one of those boring truisms.) It’s boring, yes, but also truly translates into more beautiful skin, especially if your previous diet was nutrient-poor or if you ate lots of highly processed foods and sugars. So, what’s the connection between a vegan diet and skin? We turn to the research to find out if there’s a positive connection between a vegan diet and ageing or a vegan diet and acne—the information was surprising! A vegan diet can be a very healthy way to eat, but, as with any diet, it depends on what you eat. For example, a vegan diet high in saturated fats (such as from coconut oil), sugars, and processed foods isn’t any better for you or your skin than a diet that includes mostly meat and/or dairy products. In other words, the truth in beauty is that the research hasn’t shown a vegan diet to be superior to other types of healthy eating. There are lots of vegan foods that aren’t nutritious and can lead to visible skin issues. Refined sugar and the numerous sources of it are the most problematic, but other simple carbohydrates (like flour and white rice) that are vegan-friendly can also send skin into a tailspin. In addition to investigating whether or not a vegan diet is preferred overall for better-looking skin, we also explored what the research had to say about a vegan anti-ageing diet. As it turns out, lots of foods in a vegan diet are wonderful for keeping skin looking youthful; however, there aren’t any studies—either short- or long-term—proving that a vegan diet benefits ageing skin in any way that other nutrient-rich diets don’t. If anything, a diet that includes lean animal protein, eggs, and seafood alongside fruits, vegetables, omega fatty acids, and whole grains may lead to even better results in your skin’s appearance. That’s because a strictly vegan diet (that is, no animal protein or animal by-products such as eggs) makes it difficult to routinely consume enough high-quality protein (our skin is composed mostly of protein). We know vegans aren’t going to be happy about that comment, but we’re only quoting the research; so, as the saying goes, … don’t shoot the messenger. Following a vegan diet also makes it tricky (but not impossible) to obtain certain nutrients that are more abundant in animal or animal-derived foods. Examples are calcium, iron, zinc, and vitamin B12, all of which are more easily obtained in the amounts your body needs from animal foods. We aren’t encouraging a meat-based diet; it’s just important that you know what the limitations of going vegan are and what supplements you may need to consider. Turning to acne: Does following a vegan diet lead to clearer skin? Once again, the research isn’t there to support this notion. However, some people find that dairy either triggers or worsens acne; so, because vegan diets don’t allow dairy, you may see some improvement. Otherwise, unless you’re interested in becoming vegan for other reasons, there’s no compelling evidence that eating this way will clear your skin. If you suspect dairy is a trigger, try eliminating that food group for a month or so and see how your skin responds. And no matter what your diet, always watch your consumption of sugar, so you can avoid overdoing it.